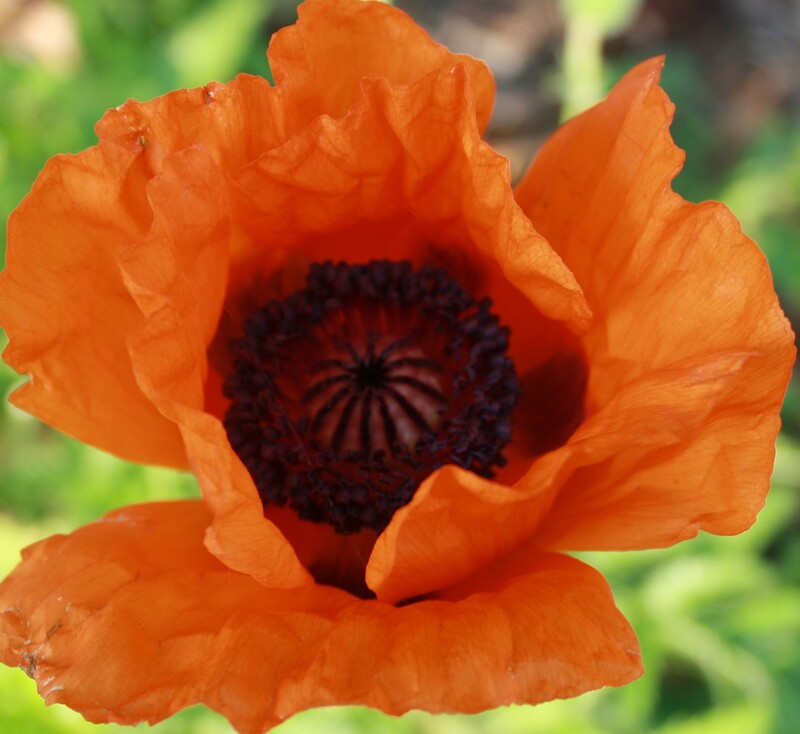 Since today is the official, original Memorial Day; I’d like to post some pictures of the Oriental Poppy. Some of us recall years ago when every corner had a veteran from either the VFW or American Legion selling their poppy flowers for a fund raiser. That is one of the strongest Memorial Day memories I have. My father, a WWII verteran always made sure he purchase them for us to wear. The poppy is in full bloom this time of year. 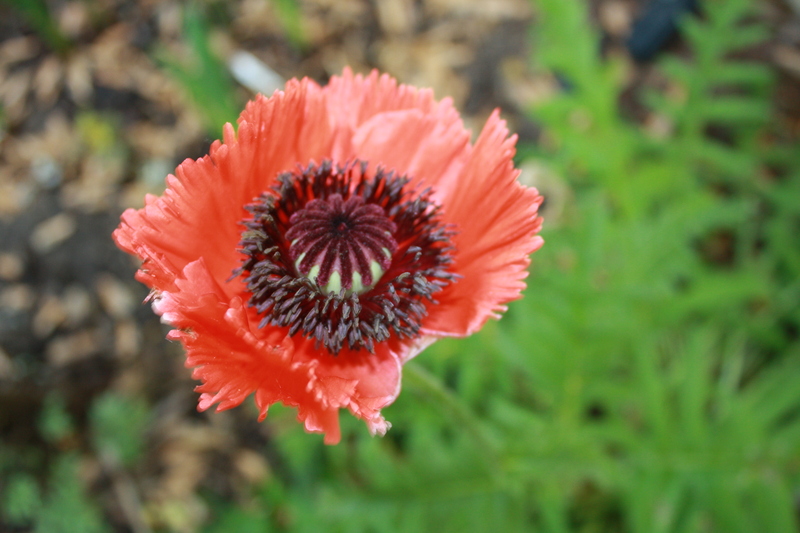 Papaver orientale is hard from Zone 3 to 8. It usually will achieve a height and spread of 1 foot to 3 foot. Although it loves full sun, it grows very well in my dappled shade locations. Not long after blooming and setting seed the foliage will die back. It’s good to plant a companion there to take over the bare space it will leave. It again shows some foliage in the fall, but begins its new grown the following spring. 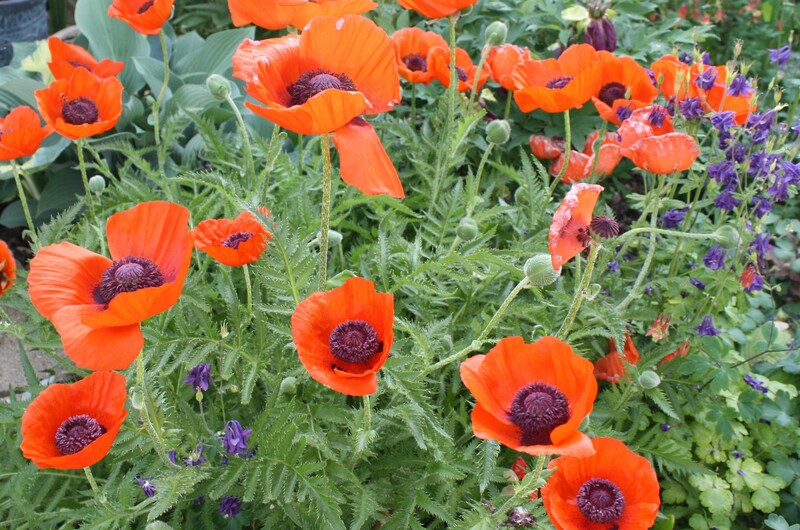 These poppies don’t take kindly to transplanting. It’s a challenge, since they die back so soon. You will have better luck early spring or waiting and sewing their seeds the next year after last frost has occurred. There is a large range of colors, including white, pink, salmon, maroon, plum and the more popular scarlet-orange. So included are a few photos from my collection planted as a tribute to those who have served our country. Sulfur Smell: Your pile may be too wet and it lacks oxygen. Aerate the pile by turning and let the pile dry out or add more dry material to it. Ammonia Smell: Chances are your kitchen scraps are not covered. Add some carbon-rich material like brown leaves and turn the pile. Sewage Smell: If it attracts some files and is smelling like sewage, you may have too much nitrogen. Bury any scraps in the center of the pile and cover it with soil or brown materials such as leaves. Announcement: MG Maggy Myers reports that the former Jacob’s Garden nursery and greenhouse is open under new ownership as Beauchamp Garden Center. The large facility at Whiteford and Sterns Rd is selling plants now and gearing up for more business. In fact, if you are looking for part-time employment, stop by there and fill out an application! Sometimes a season can be difficult on a mature tree. After a late frost last spring, a hot dry summer and a somewhat unpredictable winter, I lost my Japanese Maple in my front yard. It was sad to see it go since I planted around its red color. Well, all is not lost. Today I planted a replacement shrub, that hopefully will withstand the strong semi-sunny spot. I needed a pop of colorful foliage. I decided to plant Abelia grandiflora ‘Kaleidoscope’. It has brilliant red stems that contrast nicely with the yellow-green foliage. This plant will have color for each season. In spring it has this green center and bright yellow variegation along the outer edge. In summer, it’ll change to a darker green center with a creamy golden outer edge, and fall should bring green, yellow, orange and red foliage. It also blooms. A white, somewhat fragrant flower appears from summer until fall. It’s known to attract an array of butterflies. Its hardiness Zone is 6 (-10 degrees). Since we are now in 6A (-10 to -5 degrees) I can plant it with confidence. I didn’t want a tall plant there since my arbor gives me the height I need. This shrub will be only 2-3’…about the same height as the Japanese Maple that it’s replacing. It will grow up to a width of 3-4′. It enjoys moist, well-drained acidic soil. I have an azelia nearby that loves the same conditions. I’ve read that it is a neat, compact mounded shrub that requires minimal maintenance. That convinces me that this is the perfect shrub for that area. Spring and fall are good times for planting shrubs and small trees. It’s also when we introduce our annuals to the garden. Best time to plant those annuals is after Mothers Day. 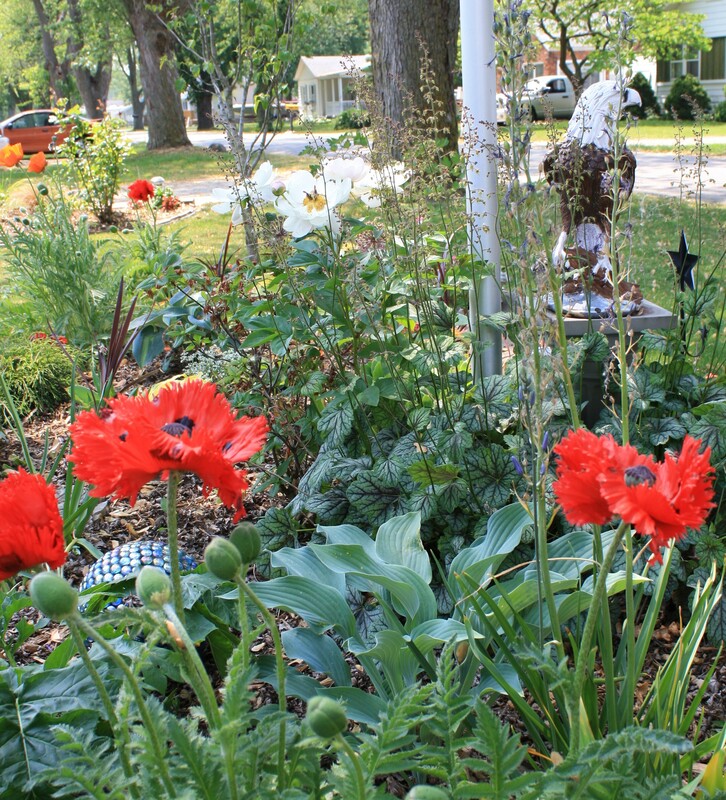 Here are a few suggestions to help out the birds and bees as well as your yard and gardens. Plants for the Bees: All of the above; if there is pollen they will come. A cherry blossom is the flower of trees of genus Prunus. Prunus Avium is commonly called wild cherry or bird cherry. The blossom as you see is white. This one grows in my neighbor’s backyard. Although I’ve noticed one brave Robin that protects the area for itself; birds invade this tree mid-summer for the fruit. Many of us plant cherry trees for the blossom and not necessarily for the fruit. Many varieties also have pink blossoms. The tree can form in many shapes as well. Blossom lovers are known to plant the Weeping Cherry which is one of the most dramatic flowering trees for the landscape. One of the most commonly planted specimens is the Yoshino cherry blossom tree. Many varieties came to the U.S. from Japan. When I think of cherry trees the first image in my mind is Potomac Park in Washington D.C. Of course next is the thought of trips to Traverse City during cherry festivals. I’ve not been in Traverse City when the trees are in bloom however. It must be a beautiful sight. Cherry tress like well-drained soil in a sunny area. The recommended planting zone is 5-9. Brown rot and blossom blight are two fungal disease which attack cherry trees. Fall is the best time to apply a copper spray to the tree after the leaves fall. Fungicide then gets applied when blossoms appear and continued on a weekly basis. However, be preventative by removing old fruit and leaves from the tree to help avoid disease.